How do you become a rickshaw rider? 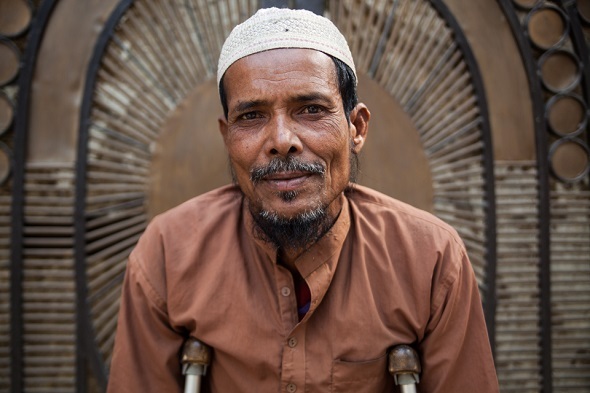 Here’s one man’s inspiring story from Bangladesh. Photos by Ana Norman Bermudez. 7 million people live in Dhaka, capital of Bangladesh. 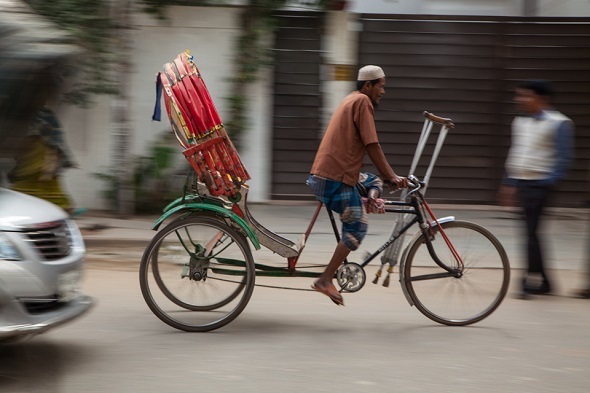 There are 400,000 rickshaws in use every day, so Dhaka has the name of Rickshaw Capital of the World. 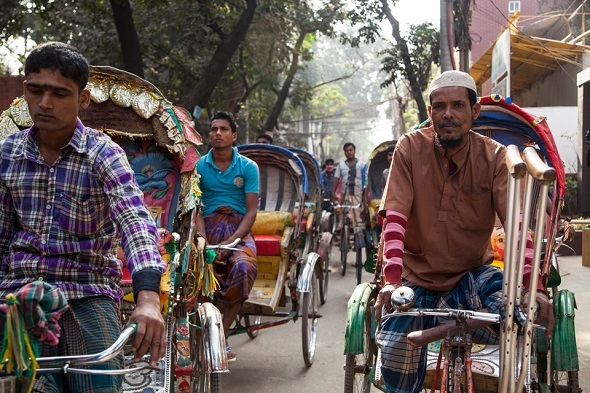 One of these rickshaw riders is 60-year-old Mostafa Mohammed. Five years ago, Mostafa lived in his home village. He lost his left foot because of an infection. Mostafa and his wife moved to Dhaka. They thought she could work as a maid and he could learn to ride a rickshaw. Finally Mostafa found someone to rent a rickshaw to him. The rickshaw is old and has problems. It needs mechanical work every day, so it is difficult to control. He pays 120 taka ($1.50) per day for the rickshaw and earns about 400 taka ($5.00) from customers. 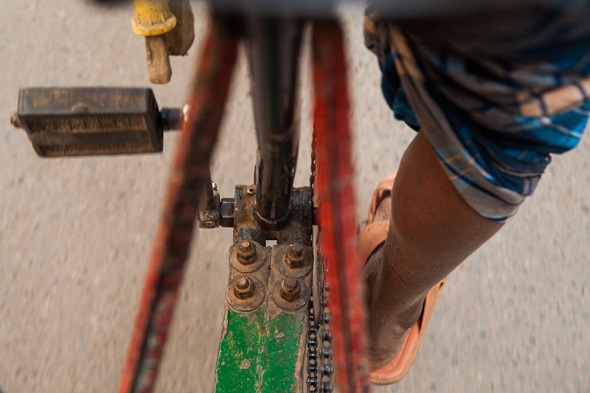 As he rides through the streets of Dhaka, other rickshaw drivers look at him and think - ‘How does he do it?’ He says ‘with determination’. Every morning Mostafa takes his wife to the Banani graveyard, where she works. Together they earn enough money to support their children. ‘School is expensive, but I have made sure that all my children finish school. I have also arranged marriages for the three of them,’ says Mostafa. He says he gets tired, but there is no choice. He has no pension schemes or help from from the government. ‘I would like to buy an auto rickshaw and go back to the village; life is much nicer there. But it would cost what I earn in a year,’ he explains. 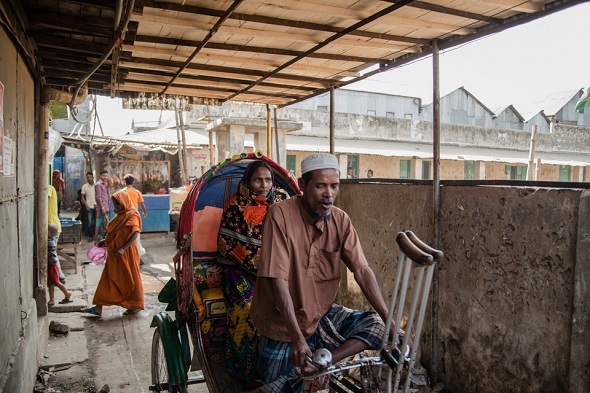 Mostafa’s journey is the same as many rickshaw drivers who leave the villages to find work in Dhaka. 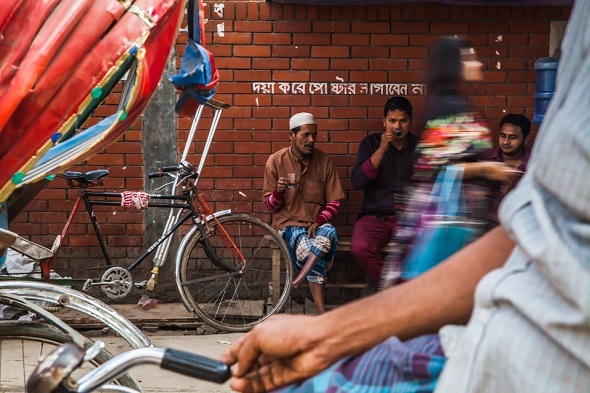 They help the Bangladeshi urban economy and cultural identity, but no-one helps them. This shows the deep inequality in all of Bangladeshi society. 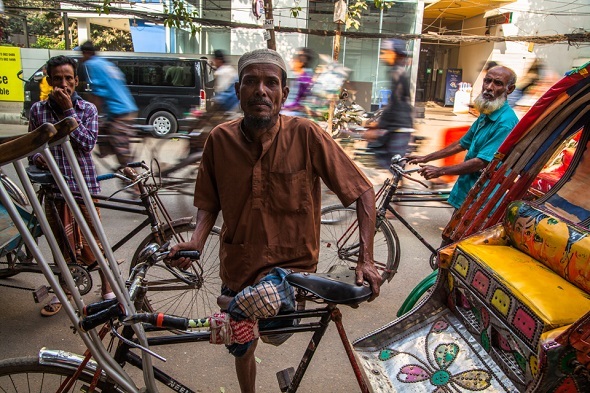 NOW READ THE ORIGINAL: http://newint.org/features/web-exclusive/2016/03/02/bangladesh-rickshaw-driver/ (This article has been simplified so the words, text structure and quotes may have been changed). This page was last edited on 2 March 2016, at 22:30.